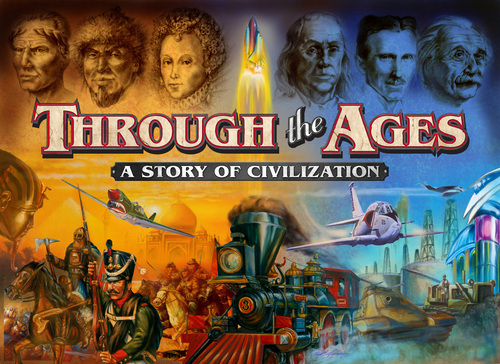 Through the Ages is an epic game. It’s very highly regarded on Boardgamegeek and there’s a very good reason for that. It is one of the best board games every conceived and I don’t say that lightly (I’ve played a few in my time and I should know). You’ve probably seen it in a few games shops as it’s been around a while and you may have picked it up (it’s heavy and compact), thought about it and put it back. big mistake. it’s gaming nirvana. I’ve only ever had the pleasure of playing it in person a few times but it’s been a lot of fun. It’s also a long game. four hours plus especially if you’re learning, but it’s well worth the time. I have however played a few dozen games of it online and that has been fantastic. At it’s core it’s a civ type game where you try to conquer the world (in this case get the highest civilization score) by advancing your civilization and at the same time sticking it to your opponents that are trying to do the same. So far so standard however what it does differently it dispense with the map. Stop stop come back it’s ok… this works. TTA is what I would term a racetrack game, to become good as it you have to ‘drive’ it a number of times to finds it’s nuances. EVERY time I’ve played it I’ve learned something new and I have to have played 40 games of it at this stage. The game moves pretty quickly, you gain resources and place your pieces to setup your income for the next turn, everyone does the same, rinse and repeat. As the ages advance you get access to newer technologies that allow you more possible actions. It’s a fine balance between keeping your people fed, happy, protected and advancing whilst throwing spanners in your opponents works and guarding against the same happening to you. The one thing I would say about the game is it’s not forgiving, especially if you’re playing against really good players, however it IS a joy to learn. There IS a steep learning curve (well for me anyway) but trust me it’s worth it.